Kale chips are all the rave now, and for good reason. They can satisfy a desire for the salty crunch all while making you feel good about your choices. This is one of the most basic recipes for kale chips and can be whipped up quickly just before you decide to reach for a bag of chips. Remove the leaves from the thick stems of the kale. Cut up or tear kale leaves into bite-size pieces. 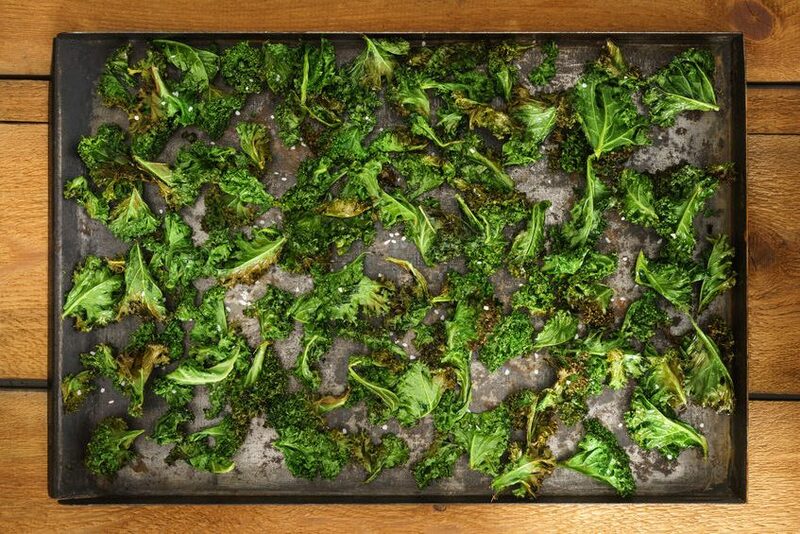 Evenly place kale on parchment paper and spray with a bit of non-stick spray, sprinkle with salt and garlic powder. Using your hands, turn the kale so that all the pieces are somewhat covered in the spray, salt, and garlic powder mixture. Place baking pan in oven and bake the kale for about 10 minutes. It will significantly shrink and wilt. Take out of the oven and stir the kale around for even cooking. Place it back into the oven and continue baking, checking every 5 minutes to stir. Remove from oven when kale is crispy and the edges are brown but not burnt. I’m interested to hear about your experience with kale chips. Do you have a favorite recipe?